These Alphabet Letter N Cards build handwriting confidence by teaching the correct letter formation guidelines from the very beginning. It is also a great visual tool for your classroom. Print and cut out the cards. Your students can focus on each letter at once. 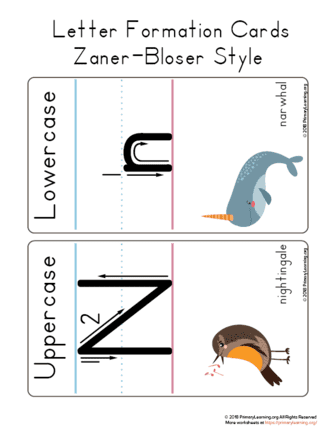 Learn how to form the Uppercase Letter N and the Lowercase Letter N. Each card has an animal starting this letter: nightingale and narwhal. This worksheet is designed in Zaner-Bloser Style.